data owned by public administrations, e.g. population, company, environmental, financial, transport, health, etc., can be efficiently collected, reused, analysed, aggregated and published as open data whenever possible. II.when new services are built they become linked with other services and they fully or partly reuse other similar existing services as much as possible. It is the equivalent of building roads to link isolated cities so that people can move, work and do business. This concept of digital interaction between concerned stakeholders with the purpose of exchanging information towards mutually beneficial goals is called ‘interoperability’. An (already implemented) example of this is a request from a citizen working abroad for recognition of her/his professional qualifications. Having interoperability in place implies that the citizen could simply submit the request to the responsible authority in the country of residence. This authority in turn uses a dedicated multilingual IT system 2 to get in touch with the authority of the requestor’s home country and ask for the certificate’s validation. Everything is done through an automated exchange of information between the relevant authorities of both countries, without the citizen’s involvement. Interoperability makes it feasible for different existing authorities to work together across countries, through the use of an IT system, multilingualism, a common specification for the structure of the exchange information, etc. IV.automation is sufficient to allow for once-only submission of personal information while minimising manual input. Interoperability is a universal requirement for a variety of EU policies, such as the single market, environment, home affairs and justice, health, customs, taxation, regional policy, research and innovation, public procurement, etc. In all these policies the need to ensure linkage and exchange of information between Member States’ public administrations, citizens and businesses is indeed embedded in the corresponding legislation and implementing instruments. a European Interoperability Strategy 8 (EIS) to set out interoperability priorities. IV.focus on the implementation of the EIF through addressing more specific recommendations. base registries accessibility, as an enabler of the ‘once-only’ principle. The implementation of the revised EIF at national level should always be guided by the proportionality principle (1st principle and recommendation of the EIF) that gives sufficient freedom to Member States administrations to tailor their interoperability activities in such a way that national particularities are respected, i.e. level of administration or type of public service where the EIF should apply. As with the original EIF, the Communication provides organisational, financial and operational directions and an interoperability action plan (Annex 1 of the Communication) to implement the revised EIF recommendations. Public administrations at national level establish their own operational models and develop their own business-specific information systems and networks, without always interacting with other public administrations. They also deliver public services to their citizens and businesses, mainly within the area of their responsibility and not always using digital means. This delivery focuses on national needs, often ignoring those of citizens and businesses from other Member States. In 2014 a very good level of 72 % alignment was reached, while the NIF implementation stood lower at 28.4 % for the 19 countries included in the ‘State of Play of Interoperability in Europe - Report 2014 18 ’. In 2015, 18 assessed countries scored better in terms of implementation, i.e. 45 %, as presented in the ‘NIFs Implementation and Monitoring State of Play 2015 19 ’, with 10 countries scoring over 50 %, and four of them scoring over 80 %, as depicted in Figure 1 . However there is a noticeable gap between countries, with Spain hitting 97.8 % and Hungary only 3.3 %. It is worth mentioning that the average level of implementation increased year-over-year by 17 % compared to 2014. Source: NIFs Implementation and Monitoring State of Play Report 2015. The wide divergence in the scores reflects the different maturity levels of the NIFs in the analysed countries. This is due to the fact that some countries have only recently started to work on interoperability and on establishing a NIF, while in other cases those activities date back several years. In 2012, more than 13.6 million EU citizens lived and worked in a Member State other than theirs. 20 All these people have to register for a pension, declare taxes, receive a birth certificate, enrol in a school, request an ID card, etc. Companies doing businesses cross-border also need to interact online with public administrations to register a new legal entity, consult business registries, pay taxes, participate in public procurements, etc. Despite the fact that public administrations of Member States continue to digitise their services and improve their interactions, the fragmented delivery of digital public services still exists. Services are often developed in isolation or with limited interaction with each other, and data is not always efficiently shared. Therefore governance of interoperability activities may need to be further improved. Fully linked (end-to-end) cross-border digital public services barely exist in Europe, as remaining digital fragmentation at national level prevents their implementation at European level. Cross-border services have to liaise with different national public services, information systems, data repositories and networks which if isolated, not fully digitised or difficult to access create barriers in the implementation of the DSM. The EU-28 Digital Economy and Society Index (DESI) weighted score for eGovernment 21 in 2016, stands only at 55.4 %. The degree to which public services are delivered by digital means varies between the Member States. The DESI for digital public services shows that in 2015 there was a significant gap between the high-scorer Estonia (86.6 %) and Bulgaria, which scored the lowest (33 %). Likewise, when it comes to cross-border services, the eGovernment benchmark insight report indicator for cross-border mobility shows a weighted average performance of only 48 % in 2014 22 and the single market scoreboard report for 2014 23 (in the context of the points of single contact under the Services Directive) recognises that cross-border accessibility is still the highest barrier for cross-border trade. The relationship between interoperability and digital public services is proven by the observation that countries scoring well in digital services scoreboards (DESI, eGovernment, single market) similarly occupy a high position in the interoperability scoreboard. As shown above, the current landscape shows a digital fragmentation at national level. This means that national digital public services are far from becoming end-to-end. This in turn results in even deeper digital fragmentation at EU level, as identified in the DSM and measured in the digital and single market scoreboards. Public administrations have to manage and host large amounts of data generated by themselves as well as from various organisations working with or on behalf of the public sector, i.e. academia, research institutes, NGOs, etc. There can be different kinds of data such as: citizens’ and businesses’ identification records; transport data related to parking places, events and planned road works, location of cameras; financial data on taxation, allowances and payments; environmental/meteorological data related to weather, floods, pollution, geospatial maps and photos; health data related to diseases, statistics on use of alcohol, smoking. There is a wide-spread use of different kinds of data in different formats (pure text, in databases, images, videos, etc.) and different security and confidentiality requirements in relation to its use, and methods to govern and organise it. This data is used by public administrations to fulfil their administrative obligations. Often this data is not covered by any specific legal regime requiring their confidentiality and can therefore be made publicly available. The value of public open data is well-known. It can be reused by different administrations within the public sector to improve the quality of public services, by businesses for commercial purposes, thus contributing to innovation and to the digital economy, and by citizens to increase their awareness about political and social life. Today public administrations digitise, exchange and often publish their data on portals, as open data. However when doing so they create many different poles of data often in different formats. This makes it difficult to aggregate, share and reuse the data. It means that there is scope for further improvement in order to have data and metadata in a syntactic and semantic shape that can be easily federated, aggregated, retrieved and searched. There is a need for interoperability between the different sets of data (datasets), met through developing specifications and standards, software tools, as well as proposing methods for governing the collection, interconnection, use and update of this data. Today public data comes in different formats, which does not allow it to be fully exploited. Public services operate in a complex environment, involving different legislations, levels of administration, information systems and specifications. For interoperability to apply there needs to be a common vision and shared objectives. A common set of priorities should be identified, including agreed implementation timeframes. Interoperability initiatives should be monitored and reported to appointed responsible authorities that have the power to decide and put the necessary measures in place. At EU level, efforts have been made through the existing EIS and initiatives such as the ISA² programme (and its predecessors) to bring relevant stakeholders together to identify and discuss interoperability needs and priorities. The interoperability landscape has been drawn to a certain extent and targeted actions have been taken. However more intense governance, coordination and monitoring at national and EU levels are needed to encourage different public administrations to work together and establish a more comprehensive overview of the interoperability environment. Public administrations often tend to work in relative isolation, without fully considering well in advance the need to be part of a wider organisational environment. They sometimes put more emphasis on their own individual needs, often ignoring the future potential of being interconnected or reusing data from other sources. The costs and benefits of implementing interoperability are not always well explored and communicated. Therefore interoperability is not always considered a worthwhile investment. Moreover, organisational complexity is often of such magnitude that harmonisation of processes, a pre-requisite for interoperability, is difficult to achieve. The situation becomes more adverse when it concerns cross-border services and data, as targeted consultation results demonstrate that more emphasis and priority is given by the Member States to the national dimension rather than to the European one. Resource shortage (financial and human) has been highlighted in the consultation as one of the main reasons impeding the implementation of interoperability nationally and in the EU. Member State administrations allocate a large part of their resources on operating and maintaining their legacy systems. When it comes to new developments, there are currently no mechanisms in place to systematically assess the possibility of reusing existing common services, solutions and specifications. This can lead to a duplication of effort as new, non-interoperable systems are developed at national and EU levels. This is not cost efficient and hampers the effective delivery of digital public services across the EU. There is scope for numerous improvements in the delivery of digital public services across the EU. The use of e-Identification and e-Signature should be generalised. Sources of information for any kind of data, i.e. population, businesses, vehicles, geospatial, environmental, judicial, etc., should be accessible and information should be structured in a form that can flow easily between the various channels, i.e. using common standards and specifications. This information should then be presented in a unified way to the end-users, i.e. through one-stop-shop portals. Services are not as user-centric as they should and could be. Putting more emphasis on security and the protection of privacy and confidentiality would create trust, which, in turn, would increase services’ uptake. public services should be easily identifiable in catalogues and be presented in a user-friendly way. Today, there are interoperability obstacles in national legislation preventing the implementation of cross-border public services, i.e. differences in dealing with data protection issues, lack of legal equivalence between digital and paper processes, national legislation imposing the use of specific standards or technologies, etc. Also in EU legislation, interoperability is considered only for policy-specific instruments, which can result in a lack of engagement from stakeholders. Moreover, legislation might create interoperability barriers, e.g. when it imposes unjustified restrictions for storage of data. Also, often different legislations lay down similar requirements in different ways, imposing the use of policy-specific digital services. This increases digital fragmentation and raises a clear need for interoperability at legal level, as was stated by the contributors to the consultation. Even in cases of binding instruments, such as the INSPIRE Directive, several Member States reported obstacles in sharing spatial data due to inconsistent national policies for data management. Public administrations can gain in efficiency and effectiveness after establishing interoperable European public services and will be more aware of the risks and costs of creating new electronic barriers if they opt for public services solutions that are not interoperable at EU level. Public administrations should coordinate with the Commission and jointly identify the top-priority interoperability actions. They should then contribute, through their participation in various programmes, i.e. ISA², CEF, to the development of key interoperability solutions and embrace (reuse and operate) them at national level. Interoperability requires an initial investment. However this could be beneficial, due to better quality of public services, less effort and shorter delivery time. The exact benefits cannot be monetised due to the diverse effects that improved interoperability might have across society. For instance, a study 28 shows that interoperability could produce benefits to governments by saving time when citizens and businesses interact with the public sector, which in turn results in more productivity that boosts GDP. less time is required for a request to be processed, meaning that working time is not spent in queues or unnecessary dealings with the public authorities. The young generation is digitally educated and their expectations in terms of quality are high, together with their willingness to take part in social dialogues/consultations, supporting decision-making processes through digital means. Improved interoperability will contribute to creating an environment of transparency within the public sector, which in turn will encourage citizens’ active involvement and participation. reusing public open data to deliver innovative solutions. Businesses can also benefit from interoperability solutions developed by the Commission for public administrations, as these are open and free to be shared and reused. Moreover, interoperability is not only beneficial for businesses when it applies to their dealings with the public sector but also when it becomes a general market practice. For example, a study on the financial benefits of interoperability in the electric power industry 29 found that it results in lower cost per transaction, increased operational efficiency and lower design, installation, and maintenance costs. A targeted consultation with the ISA Committee/coordination group members nominated by EU Member States and EEA countries (14 answers), with 12 EU institutions/agencies, 34 and an internal one across Commission departments. o‘integrated public service governance’ which ensures the collaboration of several organisations for the seamless delivery, implementation and reuse of public services and data. A synopsis report, explaining briefly how the results of all consultations have been taken into account in the Communication, is available in a separate staff working document, SWD(2017)113. Implementing the updated EIF recommendations implies costs for Member States and European institutions/agencies. As mentioned earlier in this section, it was not possible to request information concerning monetisation to the respondents during this exercise. Instead, respondents were asked to assess the costs of implementing each EIF recommendation, from 1 (least costly) to 5 (most costly). Administrative simplification and once-only submission, security and privacy, organisational interoperability and information interoperability received the highest scores in this assessment. Source: results from the open public consultation with public administrations, and the targeted consultation with EU institutions/agencies. Notes: the data is related to the responses to the question on the overall level of implementation costs of each of the EIF recommendations in each target organisation. In addition to assessing the costs of implementing the recommendations, the level of complexity or implementation feasibility was also assessed among the target groups. Respondents were asked to assess the level of complexity from 1 (very easy to implement) to 5 (very complex to implement). The most complex recommendations for public administrations were information interoperability, legal interoperability, governance and once-only submission. Notes: the data is related to the responses to the question on the overall level of complexity to implement each of the EIF recommendations in each target organisation. While implementation of the new EIF recommendations could involve costs and complexities for the target groups, it will also generate benefits. Overall, the large majority of each target group agreed that citizens and businesses will benefit from the EIF revision. Not a single participant disagreed or partially disagreed with the statement that implementing the EIF recommendations would contribute to reducing administrative burden. 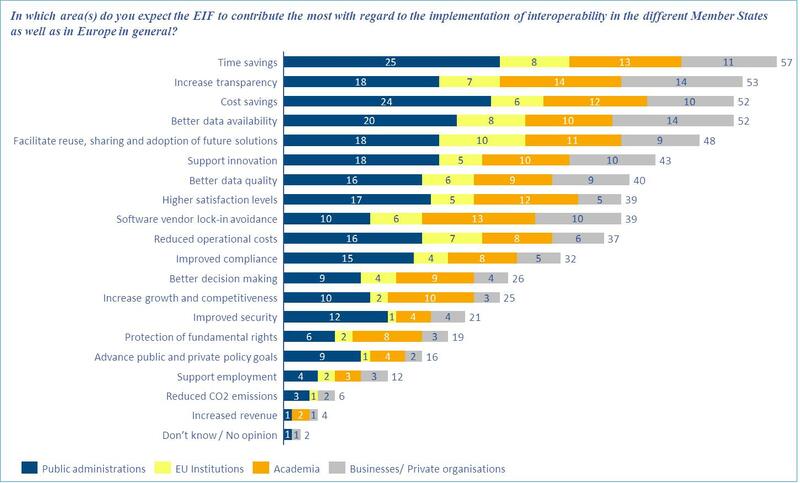 More specifically, respondents were asked to assess the level of importance of each EIF recommendation with regard to the benefits they may generate in the context of interoperability at EU level in spite of the potential complexity of implementing any individual one, from 1 (not important at all) to 5 (very important). Public administrations rated all recommendations above 4, giving the highest marks to security and privacy, effectiveness and efficiency, once-only submission and administrative simplification and data transferability. Notes: the data is related to the responses to the question on the overall level of importance of each EIF recommendation with regard to the benefits they may generate in the context of interoperability at EU level in spite of the potential complexity of implementing any individual one, in each target organisation. The results show that recommendations receiving high scores in terms of cost and complexity to implement are also identified as offering higher expected benefits. This is the case of once-only submission, administrative simplification, security and privacy and information interoperability. Most Member States have already started to implement solutions in the areas covered by the proposed recommendations including new or substantially modified ones. Consultation results confirm that common recommendations can be an important source of cost and time savings for Member States’ public administrations. Source: results from the open public consultation with public administrations, academia/research/standardisation organisations, business and private organisations and the targeted consultation with EU institutions/agencies. Notes: the data is related to the responses to the question on the main areas of contribution of the EIF. All of these are further detailed in an interoperability action plan annexed to the Communication. Despite the relatively good level of alignment between the existing EIF and NIFs, the low level of implementation of NIFs at national level has revealed a diverse level of maturity in relation to interoperability among Member States. New policies, technological evolution and lessons learned from past experience require the emergence of a new EIF to help Member States deal with interoperability challenges when putting in place modern digital public services. Having common interoperability recommendations implemented by the Member States will increase quality while minimising the cost of EU-wide solutions. The implementation of the EIF will be supported mainly by the ISA² programme and through actions included in an interoperability action plan. COM(2015) 192 final, Communication from the Commission to the European Parliament, the Council, the European Economic and Social Committee and the Committee of the Regions - A Digital Single Market Strategy for Europe, Brussels, 06.05.2015. Internal Market Information system (IMI). Decision (EU) 2015/2240 of the European Parliament and of the Council of 25 November 2015 establishing a programme on interoperability solutions and common frameworks for European public administrations, businesses and citizens (the ISA2 programme) as a means for modernising the public sector. Regulation (EU) No 283/2014 of the European Parliament and of the Council of 11 March 2014 on guidelines for trans-European networks in the area of telecommunications infrastructure and repealing Decision No 1336/97/EC. Directive 2007/2/EC of the European Parliament and of the Council of 14 March 2007 establishing an Infrastructure for Spatial Information in the European Community, INSPIRE OJ L 108, 25.4.2007, p. 1. COM(2010) 744 final, Communication from the Commission to the European Parliament, the Council, the European Economic and Social Committee and the Committee of Regions Towards interoperability for European public services, Brussels, 16.12.2010. COM(2010) 744 final: Annex 2. COM(2010) 744 final: Annex 1. Page 16 of the Communication: ‘The Commission will revise and extend the European Interoperability Framework’. 2003/98/EC, revised by Directive 2013/37/EU. COM/2016/0178 final, Communication from the Commission to the European Parliament, the Council, the European Economic and Social Committee and the Committee of the Regions - European Cloud Initiative - Building a competitive data and knowledge economy in Europe. COM(2016) 179 final, Communication from the Commission to the European Parliament, the Council, the European Economic and Social Committee and the Committee of the Regions - EU eGovernment action plan 2016-2020. COM(2016) 179 final, page 6: ‘The Commission will present a revised version of the European Interoperability Framework (EIF) and support its take-up by national administrations for the period 2016-2019’. i.e. in the proposed EIF all 12 principles are linked with a total of 19 recommendations, as opposed to the existing EIF where the same 12 principles were served only by eight recommendations. Different Member States have different ways of dealing with interoperability at high level: some introduce it in law, some in specific national interoperability frameworks, some in their digital strategies, and others use a collection of different documents and references. A NIF could be any or a combination of the above. As examples: the Netherlands implements the reusability principle with legislation on the use of the generic digital infrastructure (GDI) reusable building blocks (set of standards, products and services) by all governments, public organisations and even private parties; Luxembourg implements organisational interoperability by putting in place a Business Process Management Office (BPMO). https://joinup.ec.europa.eu/sites/default/files/2015_report_implementation_monitoring_final.pdf . Figures for 2015 on alignment are not available, and therefore cannot be reported. EU citizenship statistics on cross-border activities provided by Eurostat. It comprises, number of users, pre-filled forms, online service completion and open data. It includes four indicators in 2014: user centricity, transparent government, cross-border mobility and key enablers for eGovernment. Data collection was based on mystery shopping and 27000 user surveys for the EU-28+. Each of the indicators is further broken down in sub-indicators and receives an overall score from 0 % (weakest performance) to 100 % (best possible performance). European Commission, Study on eGovernment and the Reduction of Administrative Burden, 2014. COM(2012) 179 final, Communication from the Commission to the European Parliament, the Council, the European Economic and Social Committee and the Committee of the Regions, A strategy for e-procurement, Brussels, 20.4.2012 . COM(2013) 453 final, Communication from the Commission to the European Parliament, the Council, the European Economic and Social Committee and the Committee of the Regions, End-to-end e-procurement to modernise public administration, Brussels, 26.6.2013. The Economic Impact of Interoperability, Lorenzo Madrid, July 2012. Financial benefits of interoperability - How interoperability in the Electric Power Industry will benefit stakeholders financially, GridWise Architecture Council, September 2009. The open public consultation was available in three languages: French, English and German. 4 of those were at the time of the consultation not included in the transparency register and their answers were treated separately. For the purpose of this report ‘EU institutions/agencies’ refer to the following 12 entities: the European Centre for the Development of Vocational Training (Cedefop), the European Banking Authority (EBA), the European Monitoring Centre for Drugs and Drug Addiction (EMCDDA), the European Court of Justice (CJEU), the European Maritime Safety Agency (EMSA), the European Training Foundation (ETF), the European Food Safety Authority (EFSA), the European Parliament, Eurojust, Frontex, the European Railway Agency (ERA) and Europol. It is the expected magnitude of the costs for European institutions/agencies and Member States to implement each policy option. Monetisation was not possible as financial data would neither be of sufficient quality nor reflect reality due to the high level of uncertainties and assumptions required. Considering that direct and indirect costs for businesses and citizens are minimal, they are excluded from this assessment. In fact, businesses and citizens are not expected to face any direct costs (i.e. hassle costs, substantive compliance costs, administrative burdens) following the implementation of the policy options. On the contrary, the Communication is expected to benefit them and reduce their current administrative burden. In addition, there are no regulatory charges, such as taxes and levies, to be introduced by any policy option. The assessment focused on costs related to the necessary investments and expenses incurred by the Member States’ administrations to comply with the revised EIF, comprising all activities required to administer, communicate, promote and monitor the EIF requirements. As for monitoring the alignment and implementation of the EIF across the different Member States, the Commission will rely on existing mechanisms established by the ISA programme for the period 2010-2015 and carried on by the ISA² programme for the period 2016-2020. No major incremental costs are therefore expected, compared to the current situation (‘business as usual’). It means the extent to which it is feasible and complex for Member States to implement the EIF recommendations. It means the extent to which a policy option contributes to the ‘improvement of market efficiency’ (e.g. cost savings, time savings, better data quality, higher satisfaction rates from citizens and businesses). This was assessed by measuring the level of importance that stakeholders give to each EIF recommendation.